As a community minded business, Let’s Go Surfing are always looking for opportunities to make a positive difference through surfing. For many asylum seekers, especially those on bridging visas, life is in limbo while they wait to be settled and begin working. 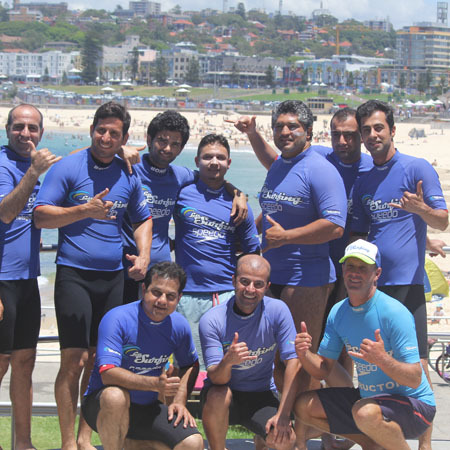 Let’s Go Surfing, in partnership with Settlement Services International, endeavors to provide these asylum seekers with the opportunity to try a quintessential Aussie sport, while taking their minds off their uncertain futures. Regular one hour lessons are provided for ten people at a time, aiming to teach participants the basics of surfing, and staying safe on Australian beaches, while having fun! Coming from places such as Afghanistan, Iran and Bangladesh, for some of the participants this program is their very first opportunity to ride a surfboard, or visit a beach. And the program brings the additional bonus of providing our staff with the opportunity to make a difference in their jobs. From the look of the broad smiles seen across our participants faces, it seems Brenda might just be right. Want to read another great story follow this link.